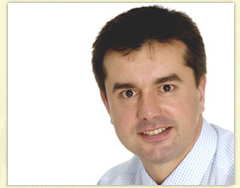 Dermoscopy UK was founded by Dr Jonathan Bowling MBChB, FRCP in 2003. He has 20 years of experience in dermatology including as a Consultant Dermatologist and Honorary Senior Clinical Lecturer at the University Of Oxford Department Of Dermatology. Dermoscopy has long been an area of great interest for Jonathan. In 2002, whilst elected as the National Dermatology Trainee Representative, he organized the first dermoscopy session for UK trainee dermatologists at the headquarters of the British Association of Dermatologists. Following this, interest and demand for more information and training in dermoscopy increased amongst not only trainees, but also through all levels of the dermatological profession. This lead to Jonathan establishing the first UK based educational meeting on dermoscopy - Dermoscopy UK. To date these meetings have provided dermoscopic education to over 3000 clinicians and have attracted international attendance from across Europe, the Caribbean and as far afield as Australia and the Falkland Islands. Jonathan is committed to education and research about dermoscopy. He is a Board Member of the International Dermoscopy Society and was a faculty member of the 1st and 2nd World Congress of Dermoscopy.